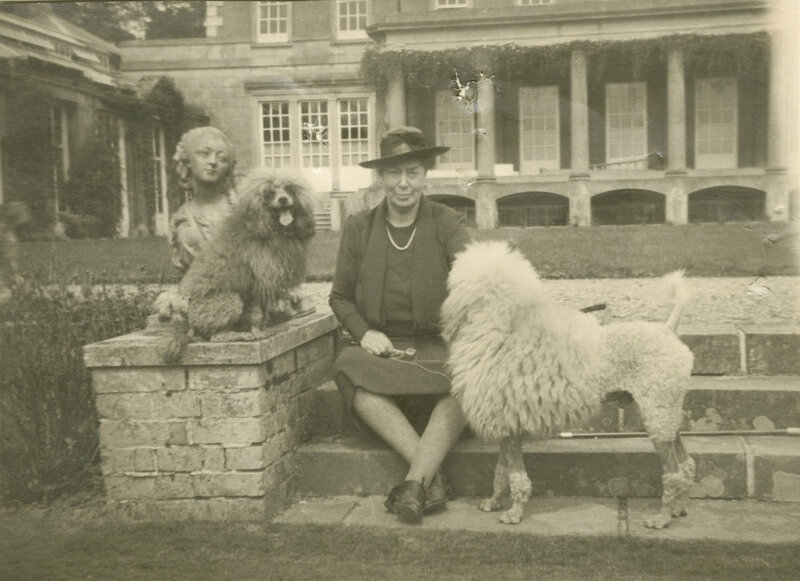 The Montagu Matysik story begins with Nellie Ionides – friend and confidante of Queen Mary – who in the 1930s started England’s largest standard poodle kennel, Vulcan, and kept it going through the darkest days of World War II. In the bluebell woods at Buxted Park, her house in Sussex, Nellie provided homes for over 100 dogs and even ran a school for kennel maids. One of Nellie Ionides' more eccentric endeavours was the weaving of poodle-wool into fine tweed, from which she had suits and overcoats tailored in Savile Row for her grandsons — clothes that are still lovingly treasured by her descendants for their soft texture, subtle colour and durability. Decades later, her great-granddaughter Georgina Montagu — a dog lover herself with her own standard poodle, Albert — happened upon a carefully wrapped package in the depths of a neglected family cupboard: the last remaining bolt of Ionides poodle-wool tweed. Stored for over 70 years, it still appeared as if fresh from the loom. The discovery of this family treasure sparked an idea. Inspired by memories of her great-grandmother’s passion, Georgina decided not only to bring this one bolt of rare fabric to use, but to revive the craft itself and the spirit in which it was originally begun. Georgina brought in the renowned London-based designer Marko Matysik to collaborate. Their work quickly developed into a creative partnership that has brought the lost art of weaving with poodle-wool into the 21st century, and has produced a new line of contemporary, sustainable, exquisitely made poodle-based felts and wools. These are now the backbone of an artisanal, British-made collection of fashionable accessories for clients — and their dogs — who are drawn to their unique, sumptuous beauty. Poodles and their pom-poms have been unfairly mocked. Strong athletic hunting dogs, with origins in medieval Germany (and originally known as the “pudel” hound) the standard poodle is a magnificent creature which has evolved a wool that is markedly different from that of most other dog breeds. “Pudel” is a relative of the English word “puddle,” denoting the special ability of these amazing dogs to swim and retrieve ducks. The traditional haircut associated with poodles descends from a time when woollen pom-poms were strategically left on joints and other parts of the dog’s body to insulate these areas in cold water. Poodle-wool is soft, fine and curly — providing great warmth while swimming. These characteristics give the wool a wonderfully soft feel and make it ideal for weaving, knitting and felting. The poodle-wool used in the collection comes from happy dogs in the ordinary course of their grooming. In return for their owners’ wool contributions, Montagu Matysik financially supports Medical Detection Dogs, a registered charity that trains and cares for cancer detection dogs.